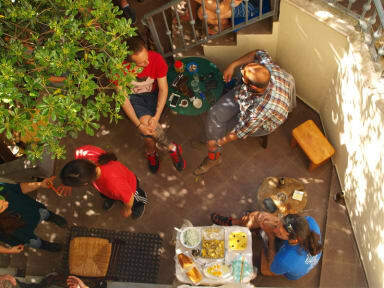 Crossroads i Thessaloniki, Grekland : Boka nu! You can have a coffee in the dooryard under the shade of trees or enjoy a glass of our homemade wine in the balcony with a panoramic view of the city. 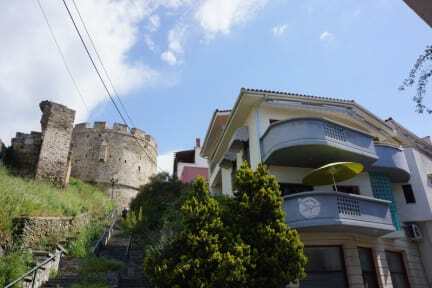 Located in a picturesque street of Thessaloniki, next to the Byzantine Walls, just 10 minutes away from the city centre, under the Trigonion Tower or Alysseos Tower. The accommodation capacity of 12 beds consists of three rooms. A six-bedded, a four-bedded and two-bed room including a twin bed and a single one. Our handmade beds have been constructed by high quality wood and ecological paints environmentally friendly, hanged from high-strength natural rope 'Manila'. I absolutely loved my stay at Crossroads. It's such a lovely little place, it's really a home away from home. I loved all of the people I met here and the vibe in general is super chill and homely. Everything is also super clean and nice. Only complaints I have is that it gets kind of cold at night during fall, but they'll provide you extra blankets so no worries. I'd also like outlets by the beds and somewhere to put your glasses at night. It's also a bit far away, but other than that perfect!